This article is about particles suspended in air. For general discussion of particulate types, see Particle § Distribution of particles. For other uses, see Particulates (disambiguation). Movie map of distribution of aerosol particles, based on data from the Moderate Resolution Imaging Spectroradiometer (MODIS) on NASA's Terra satellite. * Green areas show aerosol plumes dominated by larger particles. * Red areas show aerosol plumes dominated by small particles. * Yellow areas show where large and small aerosol particles are mixing. * Gray shows where the sensor did not collect data. Atmospheric aerosol particles – also known as atmospheric particulate matter, particulate matter (PM), particulates, or suspended particulate matter (SPM) – are microscopic solid or liquid matter suspended in the atmosphere of Earth. The term aerosol commonly refers to the particulate/air mixture, as opposed to the particulate matter alone. Sources of particulate matter can be natural or anthropogenic. They have impacts on climate and precipitation that adversely affect human health. 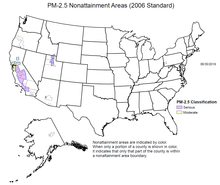 Subtypes of atmospheric particles include suspended particulate matter (SPM), thoracic and respirable particles, inhalable coarse particles, which are coarse particles with a diameter between 2.5 and 10 micrometers (μm) (PM10), fine particles with a diameter of 2.5 μm or less (PM2.5), ultrafine particles, and soot. Some particulates occur naturally, originating from volcanoes, dust storms, forest and grassland fires, living vegetation and sea spray. Human activities, such as the burning of fossil fuels in vehicles, stubble burning, power plants, wet cooling towers in cooling systems and various industrial processes, also generate significant amounts of particulates. Coal combustion in developing countries is the primary method for heating homes and supplying energy. Because salt spray over the oceans is the overwhelmingly most common form of particulate in the atmosphere, anthropogenic aerosols—those made by human activities—currently account for about 10 percent of the total mass of aerosols in our atmosphere. The composition of aerosols and particles depends on their source. Wind-blown mineral dust tends to be made of mineral oxides and other material blown from the Earth's crust; this particulate is light-absorbing. Sea salt is considered the second-largest contributor in the global aerosol budget, and consists mainly of sodium chloride originated from sea spray; other constituents of atmospheric sea salt reflect the composition of sea water, and thus include magnesium, sulfate, calcium, potassium, etc. In addition, sea spray aerosols may contain organic compounds, which influence their chemistry. The drift/mist emissions from the wet cooling towers is also source of particulate matter as they are widely used in industry and other sectors for dissipating heat in cooling systems. Secondary particles derive from the oxidation of primary gases such as sulfur and nitrogen oxides into sulfuric acid (liquid) and nitric acid (gaseous). The precursors for these aerosols—i.e. the gases from which they originate—may have an anthropogenic origin (from fossil fuel or coal combustion) and a natural biogenic origin. In the presence of ammonia, secondary aerosols often take the form of ammonium salts; i.e. ammonium sulfate and ammonium nitrate (both can be dry or in aqueous solution); in the absence of ammonia, secondary compounds take an acidic form as sulfuric acid (liquid aerosol droplets) and nitric acid (atmospheric gas), all of which may contribute to the health effects of particulates. Secondary sulfate and nitrate aerosols are strong light-scatterers. This is mainly because the presence of sulfate and nitrate causes the aerosols to increase to a size that scatters light effectively. Organic matter (OM) can be either primary or secondary, the latter part deriving from the oxidation of VOCs; organic material in the atmosphere may either be biogenic or anthropogenic. Organic matter influences the atmospheric radiation field by both scattering and absorption. Another important aerosol type is elemental carbon (EC, also known as black carbon, BC): this aerosol type includes strongly light-absorbing material and is thought to yield large positive radiative forcing. Organic matter and elemental carbon together constitute the carbonaceous fraction of aerosols. Secondary organic aerosols (SOAs), tiny "tar balls" resulting from combustion products of internal combustion engines, have been identified as a danger to health. The chemical composition of the aerosol directly affects how it interacts with solar radiation. The chemical constituents within the aerosol change the overall refractive index. The refractive index will determine how much light is scattered and absorbed. The composition of particulate matter that generally causes visual effects such as smog consists of sulfur dioxide, nitrogen oxides, carbon monoxide, mineral dust, organic matter, and elemental carbon also known as black carbon or soot. The particles are hygroscopic due to the presence of sulfur, and SO2 is converted to sulfate when high humidity and low temperatures are present. This causes the reduced visibility and yellow color. Aerosol particles of natural origin (such as windblown dust) tend to have a larger radius than human-produced aerosols such as particle pollution. The false-color maps in the third image on this page show where there are natural aerosols, human pollution, or a mixture of both, monthly. In general, the smaller and lighter a particle is, the longer it will stay in the air. Larger particles (greater than 10 micrometers in diameter) tend to settle to the ground by gravity in a matter of hours whereas the smallest particles (less than 1 micrometer) can stay in the atmosphere for weeks and are mostly removed by precipitation. Diesel particulate matter is highest near the source of emission. Any info regarding DPM and the atmosphere, flora, height, and distance from major sources would be useful to determine health effects. A complicated blend of solid and liquid particles result in particulate matter and these particulate matter emissions are highly regulated in most industrialized countries. Due to environmental concerns, most industries are required to operate some kind of dust collection system to control particulate emissions. These systems include inertial collectors (cyclonic separators), fabric filter collectors (baghouses), wet scrubbers, and electrostatic precipitators. Cyclonic separators are useful for removing large, coarse particles and are often employed as a first step or "pre-cleaner" to other more efficient collectors. Well-designed cyclonic separators can be very efficient in removing even fine particulates, and may be operated continuously without requiring frequent shutdowns for maintenance. Fabric filters or baghouses are the most commonly employed in general industry. They work by forcing dust laden air through a bag shaped fabric filter leaving the particulate to collect on the outer surface of the bag and allowing the now clean air to pass through to either be exhausted into the atmosphere or in some cases recirculated into the facility. Common fabrics include polyester and fiberglass and common fabric coatings include PTFE (commonly known as Teflon). The excess dust buildup is then cleaned from the bags and removed from the collector. Wet scrubbers pass the dirty air through a scrubbing solution (usually a mixture of water and other compounds) allowing the particulate to attach to the liquid molecules. Electrostatic precipitators electrically charge the dirty air as it passes through. The now charged air then passes through large electrostatic plates which attract the charged particle in the airstream collecting them and leaving the now clean air to be exhausted or recirculated. Besides removing particulates from the source of the pollution, it can also be cleaned in the open air. 2005 radiative forcings and uncertainties as estimated by the IPCC. Atmospheric aerosols affect the climate of the earth by changing the amount of incoming solar radiation and outgoing terrestrial longwave radiation retained in the earth's system. This occurs through several distinct mechanisms which are split into direct, indirect and semi-direct aerosol effects. The aerosol climate effects are the biggest source of uncertainty in future climate predictions. The Intergovernmental Panel on Climate Change, Third Assessment Report, says: While the radiative forcing due to greenhouse gases may be determined to a reasonably high degree of accuracy... the uncertainties relating to aerosol radiative forcings remain large, and rely to a large extent on the estimates from global modelling studies that are difficult to verify at the present time. Global aerosol optical thickness. The aerosol scale (yellow to dark reddish-brown) indicates the relative amount of particles that absorb sunlight. These maps show average monthly aerosol amounts around the world based on observations from the Moderate Resolution Imaging Spectroradiometer (MODIS) on NASA's Terra satellite. The direct aerosol effect consists of any direct interaction of radiation with atmospheric aerosols, such as absorption or scattering. It affects both short and longwave radiation to produce a net negative radiative forcing. The magnitude of the resultant radiative forcing due to the direct effect of an aerosol is dependent on the albedo of the underlying surface, as this affects the net amount of radiation absorbed or scattered to space. e.g. if a highly scattering aerosol is above a surface of low albedo it has a greater radiative forcing than if it was above a surface of high albedo. The converse is true of absorbing aerosol, with the greatest radiative forcing arising from a highly absorbing aerosol over a surface of high albedo. The direct aerosol effect is a first order effect and is therefore classified as a radiative forcing by the IPCC. The interaction of an aerosol with radiation is quantified by the single-scattering albedo (SSA), the ratio of scattering alone to scattering plus absorption (extinction) of radiation by a particle. The SSA tends to unity if scattering dominates, with relatively little absorption, and decreases as absorption increases, becoming zero for infinite absorption. For example, the sea-salt aerosol has an SSA of 1, as a sea-salt particle only scatters, whereas soot has an SSA of 0.23, showing that it is a major atmospheric aerosol absorber. The Indirect aerosol effect consists of any change to the earth's radiative budget due to the modification of clouds by atmospheric aerosols, and consists of several distinct effects. Cloud droplets form onto pre-existing aerosol particles, known as cloud condensation nuclei (CCN). For any given meteorological conditions, an increase in CCN leads to an increase in the number of cloud droplets. This leads to more scattering of shortwave radiation i.e. an increase in the albedo of the cloud, known as the Cloud albedo effect, First indirect effect or Twomey effect. Evidence supporting the cloud albedo effect has been observed from the effects of ship exhaust plumes and biomass burning on cloud albedo compared to ambient clouds. The Cloud albedo aerosol effect is a first order effect and therefore classified as a radiative forcing by the IPCC. An increase in cloud droplet number due to the introduction of aerosol acts to reduce the cloud droplet size, as the same amount of water is divided into more droplets. This has the effect of suppressing precipitation, increasing the cloud lifetime, known as the cloud lifetime aerosol effect, second indirect effect or Albrecht effect. This has been observed as the suppression of drizzle in ship exhaust plume compared to ambient clouds, and inhibited precipitation in biomass burning plumes. This cloud lifetime effect is classified as a climate feedback (rather than a radiative forcing) by the IPCC due to the interdependence between it and the hydrological cycle. However, it has previously been classified as a negative radiative forcing. The Semi-direct effect concerns any radiative effect caused by absorbing atmospheric aerosol such as soot, apart from direct scattering and absorption, which is classified as the direct effect. It encompasses many individual mechanisms, and in general is more poorly defined and understood than the direct and indirect aerosol effects. For instance, if absorbing aerosols are present in a layer aloft in the atmosphere, they can heat surrounding air which inhibits the condensation of water vapour, resulting in less cloud formation. Additionally, heating a layer of the atmosphere relative to the surface results in a more stable atmosphere due to the inhibition of atmospheric convection. This inhibits the convective uplift of moisture, which in turn reduces cloud formation. The heating of the atmosphere aloft also leads to a cooling of the surface, resulting in less evaporation of surface water. The effects described here all lead to a reduction in cloud cover i.e. an increase in planetary albedo. The semi-direct effect classified as a climate feedback) by the IPCC due to the interdependence between it and the hydrological cycle. However, it has previously been classified as a negative radiative forcing. Sulfate aerosol has two main effects, direct and indirect. The direct effect, via albedo, is a cooling effect that slows the overall rate of global warming: the IPCC's best estimate of the radiative forcing is −0.4 watts per square meter with a range of −0.2 to −0.8 W/m² but there are substantial uncertainties. The effect varies strongly geographically, with most cooling believed to be at and downwind of major industrial centres. Modern climate models addressing the attribution of recent climate change take into account sulfate forcing, which appears to account (at least partly) for the slight drop in global temperature in the middle of the 20th century. The indirect effect (via the aerosol acting as cloud condensation nuclei, CCN, and thereby modifying the cloud properties -albedo and lifetime-) is more uncertain but is believed to be a cooling. Black carbon (BC), or carbon black, or elemental carbon (EC), often called soot, is composed of pure carbon clusters, skeleton balls and buckyballs, and is one of the most important absorbing aerosol species in the atmosphere. It should be distinguished from organic carbon (OC): clustered or aggregated organic molecules on their own or permeating an EC buckyball. BC from fossil fuels is estimated by the IPCC in the Fourth Assessment Report of the IPCC, 4AR, to contribute a global mean radiative forcing of +0.2 W/m² (was +0.1 W/m² in the Second Assessment Report of the IPCC, SAR), with a range +0.1 to +0.4 W/m². Bond et al., however, states that "the best estimate for the industrial-era (1750 to 2005) direct radiative forcing of atmospheric black carbon is +0.71 W/m² with 90% uncertainty bounds of (+0.08, +1.27) W/m²" with "total direct forcing by all black carbon sources, without subtracting the preindustrial background, is estimated as +0.88 (+0.17, +1.48) W/m²"
Volcanoes are a large natural source of aerosol and have been linked to changes in the earth's climate often with consequences for the human population. Eruptions linked to changes in climate include the 1600 eruption of Huaynaputina which was linked to the Russian famine of 1601 - 1603, leading to the deaths of two million, and the 1991 eruption of Mount Pinatubo which caused a global cooling of approximately 0.5 °C lasting several years. Research tracking the effect of light-scattering aerosols in the stratosphere during 2000 and 2010 and comparing its pattern to volcanic activity show a close correlation. Simulations of the effect of anthropogenic particles showed little influence at present levels. Aerosols are also thought to affect weather and climate on a regional scale. The failure of the Indian Monsoon has been linked to the suppression of evaporation of water from the Indian Ocean due to the semi-direct effect of anthropogenic aerosol. The latest studies of severe rainfall decline over southern Australia since 1997 have led climatologists there to consider the possibility that these Asian aerosols have shifted not only tropical but also midlatitude systems southward. Similarly, so called fine particulate matter (PM2.5), tend to penetrate into the gas exchange regions of the lung (alveolus), and very small particles (ultrafine particulate matter, PM0.1) may pass through the lungs to affect other organs. Penetration of particles is not wholly dependent on their size; shape and chemical composition also play a part. To avoid this complication, simple nomenclature is used to indicate the different degrees of relative penetration of a PM particle into the cardiovascular system. Inhalable particles penetrate no further than the bronchi as they are filtered out by the cilia. Thoracic particles can penetrate right into terminal bronchioles whereas PM0.1, which can penetrate to alveoli, the gas exchange area, and hence the circulatory system are termed respirable particles. In analogy, the inhalable dust fraction is the fraction of dust entering nose and mouth which may be deposited anywhere in the respiratory tract. The thoracic fraction is the fraction that enters the thorax and is deposited within the lung's airways. The respirable fraction is what is deposited in the gas exchange regions (alveoli). The smallest particles, less than 100 nanometers (nanoparticles), may be even more damaging to the cardiovascular system. Nanoparticles can pass through cell membranes and migrate into other organs, including the brain. Particles emitted from modern diesel engines (commonly referred to as Diesel Particulate Matter, or DPM) are typically in the size range of 100 nanometers (0.1 micrometer). These soot particles also carry carcinogens like benzopyrenes adsorbed on their surface. Particulate mass is not a proper measure of the health hazard, because one particle of 10 µm diameter has approximately the same mass as 1 million particles of 100 nm diameter, but is much less hazardous, as it is unlikely to enter the alveoli. Legislative limits for engine emissions based on mass are therefore not protective. Proposals for new regulations exist in some countries,[which?] with suggestions to limit the particle surface area or the particle count (numerical quantity) instead. The site and extent of absorption of inhaled gases and vapors are determined by their solubility in water. Absorption is also dependent upon air flow rates and the partial pressure of the gases in the inspired air. The fate of a specific contaminant is dependent upon the form in which it exists (aerosol or particulate). Inhalation also depends upon the breathing rate of the subject. Another complexity not entirely documented is how the shape of PM can affect health, except for the needle-like shape of asbestos which can lodge itself in the lungs. Geometrically angular shapes have more surface area than rounder shapes, which in turn affects the binding capacity of the particle to other, possibly more dangerous substances. The effects of inhaling particulate matter that has been widely studied in humans and animals include asthma, lung cancer, respiratory diseases, cardiovascular disease, premature delivery, birth defects, low birth weight, and premature death. Inhalation of PM2.5 – PM10 is associated with elevated risk of adverse pregnancy outcomes, such as low birth weight . Maternal PM2.5 exposure during pregnancy is also associated with high blood pressure in children. Exposure to PM2.5 has been associated with greater reductions in birth weight than exposure to PM10. PM exposure can cause inflammation, oxidative stress, endocrine disruption, and impaired oxygen transport access to the placenta, all of which are mechanisms for heightening the risk of low birth weight. Overall epidemiologic and toxicological evidence suggests that a causal relationship exists between long-term exposures to PM2.5 and developmental outcomes (i.e. low birth weight). However, studies investigating the significance of trimester-specific exposure have proven to be inconclusive, and results of international studies have been inconsistent in drawing associations of prenatal particulate matter exposure and low birth weight. As perinatal outcomes have been associated with lifelong health and exposure to particulate matter is widespread, this issue is of critical public health importance and additional research will be essential to inform public policy on the matter. Increased levels of fine particles in the air as a result of anthropogenic particulate air pollution "is consistently and independently related to the most serious effects, including lung cancer and other cardiopulmonary mortality." A large number of deaths and other health problems associated with particulate pollution was first demonstrated in the early 1970s and has been reproduced many times since. PM pollution is estimated to cause 22,000–52,000 deaths per year in the United States (from 2000) contributed to ~370,000 premature deaths in Europe during 2005. and 3.22 million deaths globally in 2010 per the global burden of disease collaboration. A 2002 study indicated that PM2.5 leads to high plaque deposits in arteries, causing vascular inflammation and atherosclerosis – a hardening of the arteries that reduces elasticity, which can lead to heart attacks and other cardiovascular problems. A 2014 meta analysis reported that long term exposure to particulate matter is linked to coronary events. The study included 11 cohorts participating in the European Study of Cohorts for Air Pollution Effects (ESCAPE) with 100,166 participants, followed for an average of 11.5 years. An increase in estimated annual exposure to PM 2.5 of just 5 µg/m3 was linked with a 13% increased risk of heart attacks. In 2017 a study revealed that PM not only affects human cells and tissues, but also impacts bacteria which cause disease in humans. This study concluded that biofilm formation, antibiotic tolerance, and colonisation of both Staphylococcus aureus and Streptococcus pneumoniae was altered by Black Carbon exposure. The World Health Organization (WHO) estimated in 2005 that "... fine particulate air pollution (PM(2.5)), causes about 3% of mortality from cardiopulmonary disease, about 5% of mortality from cancer of the trachea, bronchus, and lung, and about 1% of mortality from acute respiratory infections in children under 5 years, worldwide.". A 2011 study concluded that traffic exhaust is the single most serious preventable cause of heart attack in the general public, the cause of 7.4% of all attacks. The largest US study on acute health effects of coarse particle pollution between 2.5 and 10 micrometers in diameter. was published 2008 and found an association with hospital admissions for cardiovascular diseases but no evidence of an association with the number of hospital admissions for respiratory diseases. After taking into account fine particle levels (PM2.5 and less), the association with coarse particles remained but was no longer statistically significant, which means the effect is due to the subsection of fine particles. Particulate matter studies in Bangkok Thailand from 2008 indicated a 1.9% increased risk of dying from cardiovascular disease, and 1.0% risk of all disease for every 10 micrograms per cubic meter. Levels averaged 65 in 1996, 68 in 2002, and 52 in 2004. Decreasing levels may be attributed to conversions of diesel to natural gas combustion as well as improved regulations. The Mongolian government agency recorded a 45% increase in the rate of respiratory illness in the past five years (reported in September 2014). Bronchial asthma, chronic obstructive pulmonary disease and interstitial pneumonia were the most common ailments treated by area hospitals. Levels of premature death, chronic bronchitis, and cardiovascular disease are increasing at a rapid rate. A study In 2000 conducted in the U.S. explored how fine particulate matter may be more harmful than coarse particulate matter. The study was based on six different cities. They found that deaths and hospital visits that were caused by particulate matter in the air were primarily due fine particulate matter. Particulate matter can clog stomatal openings of plants and interfere with photosynthesis functions. In this manner, high particulate matter concentrations in the atmosphere can lead to growth stunting or mortality in some plant species. Due to the highly toxic health effects of particulate matter, most governments have created regulations both for the emissions allowed from certain types of pollution sources (motor vehicles, industrial emissions etc.) and for the ambient concentration of particulates. The IARC and WHO designate particulates a Group 1 carcinogen. Particulates are the deadliest form of air pollution due to their ability to penetrate deep into the lungs and blood streams unfiltered, causing permanent DNA mutations, heart attacks and premature death. In 2013, the ESCAPE study involving 312,944 people in nine European countries revealed that there was no safe level of particulates and that for every increase of 10 μg/m3 in PM10, the lung cancer rate rose 22%. For PM2.5 there was a 36% increase in lung cancer per 10 μg/m3. In a 2014 meta-analysis of 18 studies globally including the ESCAPE data, for every increase of 10 μg/m3 in PM2.5, the lung cancer rate rose 9%. In Canada the standard for particulate matter is set nationally by the federal-provincial Canadian Council of Ministers of the Environment (CCME). Jurisdictions (provinces and territories) may set more stringent standards. The CCME standard for particulate matter 2.5 (PM2.5) as of 2015 is 28 μg/m3 (calculated using the 3-year average of the annual 98th percentile of the daily 24-hr average concentrations) and 10 μg/m³ (3-year average of annual mean). PM2.5 standards will increase in stringency in 2020. In October 2008, the Department of Toxic Substances Control (DTSC), within the California Environmental Protection Agency, announced its intent to request information regarding analytical test methods, fate and transport in the environment, and other relevant information from manufacturers of carbon nanotubes. DTSC is exercising its authority under the California Health and Safety Code, Chapter 699, sections 57018-57020. These sections were added as a result of the adoption of Assembly Bill AB 289 (2006). They are intended to make information on the fate and transport, detection and analysis, and other information on chemicals more available. The law places the responsibility to provide this information to the Department on those who manufacture or import the chemicals. On 22 January 2009, a formal information request letter was sent to manufacturers who produce or import carbon nanotubes in California, or who may export carbon nanotubes into the State. This letter constitutes the first formal implementation of the authorities placed into statute by AB 289 and is directed to manufacturers of carbon nanotubes, both industry and academia within the State, and to manufacturers outside California who export carbon nanotubes to California. This request for information must be met by the manufacturers within one year. DTSC is waiting for the upcoming 22 January 2010 deadline for responses to the data call-in. The California Nano Industry Network and DTSC hosted a full-day symposium on 16 November 2009 in Sacramento, CA. This symposium provided an opportunity to hear from nanotechnology industry experts and discuss future regulatory considerations in California. DTSC is expanding the Specific Chemical Information Call-in to members of the nanometal oxides, the latest information can be found on their website. Key points in the Colorado Plan include reducing emission levels and solutions by sector. Agriculture, transportation, green electricity, and renewable energy research are the main concepts and goals in this plan. Political programs such as mandatory vehicle emissions testing and the prohibition of smoking indoors are actions taken by local government to create public awareness and participation in cleaner air. The location of Denver next to the Rocky Mountains and wide expanse of plains makes the metro area of Colorado's capital city a likely place for smog and visible air pollution. The most concentrated particulate matter pollution resulting from the burning of fossil fuels by transportation and industrial sources tends to be in densely populated metropolitan areas in developing countries such as Delhi and Beijing. PM10 pollution in coal mining areas in Australia such as the Latrobe Valley in Victoria and the Hunter Region in New South Wales significantly increased during 2004 to 2014. Although the increase did not significantly add to non-attainment statistics the rate of increase has risen each year during 2010 to 2014. Some cities in Northern China and South Asia have had concentrations above 200 µg/m3 up to a few years ago[when?]. The PM levels in Chinese cities have been extreme in recent years[when? ], reaching an all-time high in Beijing on 12 January 2013, of 993 µg/m3. To monitor the air quality of south China, the U.S. Consulate Guangzhou set a PM 2.5 monitor on Shamian Island in Guangzhou, and displays readings on its official website and social platforms. Mongolia's capital city Ulaanbaatar has an annual average mean temperature of about 0 °C, making it the world's coldest capital city. About 40% of the population lives in apartments, 80% of which are supplied with central heating systems from 3 combined heat and power plants. In 2007, the power plants consumed almost 3.4 million tons of coal. The pollution control technology is in poor condition. The other 60% of the population reside in shantytowns (Ger districts), which have developed due to the country's new market economy and the very cold winter seasons. The poor in these districts cook and heat their wood houses with indoor stoves fueled by wood or coal. The resulting air pollution is characterized by raised sulfur dioxide and nitrogen oxide levels and very high concentrations of airborne particles and particulate matter (PM). Annual seasonal average particulate matter concentrations have been recorded as high as 279 µg/m3 (micrograms per cubic meter). The World Health Organization's recommended annual mean PM10 level is 20 µg/m3, which means that Ulaanbaatar's PM10 annual mean levels are 14 times higher than recommended. During the winter months in particular, the air pollution obscures the air, affecting the visibility in the city to such an extent that airplanes on some occasions are prevented from landing at the airport. In addition to stack emissions, another source unaccounted for in the emission inventory is fly ash from ash ponds, the final disposal place for fly ash that has been collected in settling tanks. Ash ponds are continually eroded by wind during the dry season. ^ Seinfeld, John; Spyros Pandis (1998). Atmospheric Chemistry and Physics: From Air Pollution to Climate Change (2nd ed.). Hoboken, New Jersey: John Wiley & Sons. p. 97. ISBN 978-0-471-17816-3. ^ Plainiotis, S.; Pericleous, K.A. ; Fisher, B.E.A. ; Shier, L. (January 2010). "Application of Lagrangian particle dispersion models to air quality assessment in the Trans-Manche region of Nord-Pas-de-Calais (France) and Kent (Great Britain)". International Journal of Environment and Pollution (IJEM). 40 (1/2/3): 160–174. doi:10.1504/IJEP.2010.030891. ^ Brown, J. S.; Gordon, T.; Price, O.; Asgharian, B. (2013). "Thoracic and respirable particle definitions for human health risk assessment". Part Fibre Toxicol. 10: 12. doi:10.1186/1743-8977-10-12. PMC 3640939. PMID 23575443. ^ "EHP – Outdoor Particulate Matter Exposure and Lung Cancer: A Systematic Review and Meta-Analysis". ehp.niehs.nih.gov. Retrieved 29 December 2016. ^ a b "Health | Particulate Matter | Air & Radiation | US EPA". Epa.gov. 17 November 2010. Archived from the original on 2 October 2006. Retrieved 1 February 2015. ^ a b c Ole Raaschou-Nielsen; et al. (10 July 2013). "Air pollution and lung cancer incidence in 17 European cohorts: prospective analyses from the European Study of Cohorts for Air Pollution Effects (ESCAPE)". The Lancet Oncology. 14 (9): 813–22. doi:10.1016/S1470-2045(13)70279-1. PMID 23849838. Retrieved 10 July 2013. Particulate matter air pollution contributes to lung cancer incidence in Europe. ^ "STATE OF GLOBAL AIR/2018 A SPECIAL REPORT ON GLOBAL EXPOSURE TO AIR POLLUTION AND ITS DISEASE BURDEN" (PDF). Health Effects Institute. 2018. ^ "The Weight of Numbers: Air Pollution and PM2.5". Undark. Retrieved 6 September 2018. ^ Omidvarborna; et al. (2015). "Recent studies on soot modeling for diesel combustion". Renewable and Sustainable Energy Reviews. 48: 635–647. doi:10.1016/j.rser.2015.04.019. ^ a b Hardin, Mary; Kahn, Ralph. "Aerosols and Climate Change". ^ "Primary and Secondary Sources of Aerosols: Soil dust". Climate Change 2001: Working Group 1. UNEP. 2001. ^ Perraud, V.; Bruns, E. A.; Ezell, M. J.; Johnson, S. N.; Yu, Y.; Alexander, M. L.; Zelenyuk, A.; Imre, D.; Chang, W. L.; Dabdub, D.; Pankow, J. F.; Finlayson-Pitts, B. J. (30 January 2012). "Nonequilibrium atmospheric secondary organic aerosol formation and growth". Proceedings of the National Academy of Sciences of the United States of America. 109 (8): 2836–41. Bibcode:2012PNAS..109.2836P. doi:10.1073/pnas.1119909109. PMC 3286997. PMID 22308444. ^ "Primary and Secondary Sources of Aerosols: Sea salt". Climate Change 2001: Working Group 1. UNEP. 2001. ^ "Wet cooling towers: guide to reporting". Retrieved 19 October 2018. ^ Int Panis, L.L.R. (2008). "The Effect of Changing Background Emissions on External Cost Estimates for Secondary Particulates". Open Environmental Sciences. 2: 47–53. doi:10.2174/1876325100802010047. ^ "Primary and Secondary Sources of Aerosols: Primary biogenic aerosols". Climate Change 2001: Working Group 1. UNEP. 2001. ^ "Primary and Secondary Sources of Aerosols: Carbonaceous aerosols". Climate Change 2001: Working Group 1. UNEP. 2001. ^ Felicity Barringer (18 February 2012). "Scientists Find New Dangers in Tiny but Pervasive Particles in Air Pollution". The New York Times. Retrieved 19 February 2012. Fine atmospheric particles – smaller than one-thirtieth of the diameter of a human hair – were identified more than 20 years ago as the most lethal of the widely dispersed air pollutants in the United States. Linked to both heart and lung disease, they kill an estimated 50,000 Americans each year. ^ a b c d "Mongolia: Air Pollution in Ulaanbaatar – Initial Assessment of Current Situations and Effects of Abatement Measures" (PDF). The World Bank. 2010. Archived from the original (PDF) on 19 September 2016. ^ Click for more detail. ^ "Behaviour Study of Particulate Matter and Chemical Composition with Different Combustion Strategies". Retrieved 17 June 2016. ^ "Effect Of Particulate Matter On Plants Climate, Ecosystem and Human Health" (PDF). www.ijates.com. April 2014. Retrieved 3 February 2016. ^ "Dry Dust Collection Systems & Bulk Handling | Cyclonaire". Cyclonaire. Retrieved 3 February 2016. ^ Dominick DalSanto. "The Encyclopedia of Dust Collection". ^ a b Haywood, James; Boucher, Olivier (2000). "Estimates of the direct and indirect radiative forcing due to tropospheric aerosols: A review". Reviews of Geophysics. 38 (4): 513. Bibcode:2000RvGeo..38..513H. doi:10.1029/1999RG000078. Archived from the original on 23 February 2013. Retrieved 11 August 2012. ^ a b Twomey, S. (1977). "The influence of pollution on the shortwave albedo of clouds". Journal of the Atmospheric Sciences. 34 (7): 1149–1152. Bibcode:1977JAtS...34.1149T. doi:10.1175/1520-0469(1977)034<1149:TIOPOT>2.0.CO;2. ^ a b c d e f Forster, Piers; Venkatachalam Ramaswamy; Paulo Artaxo; Terje Berntsen; Richard Betts; David W Fahey; James Haywood; 2007; et al. "Contribution of Working Group I to the Fourth Assessment Report of the Intergovernmental Panel on Climate Change in Climate Change 2007: The Physical Science Basis". In S. Solomon; D. Qin; M. Manning; Z. Chen; M. Marquis; K.B. Averyt; M.Tignor; H.L. Miller (eds.). Changes in Atmospheric Constituents and in Radiative Forcing. Cambridge, United Kingdom and New York, NY, USA: Cambridge University Press. pp. 129–234. ^ "6.7.8 Discussion of Uncertainties". IPCC Third Assessment Report – Climate Change 2001. Archived from the original on 28 February 2002. Retrieved 14 July 2012. ^ Charlson, R.J.; S E Schwartz; J M Hales; R D Cess; J A Coakley; J E Hansen; D J Hofmann (1992). "Climate forcing by anthropogenic aerosols". Science. 255 (5043): 423–30. Bibcode:1992Sci...255..423C. doi:10.1126/science.255.5043.423. PMID 17842894. ^ Ackerman, A S; Toon, O B; Taylor, J P; Johnson, D W; Hobbs, P V; Ferek, R J (2000). "Effects of Aerosols on Cloud Albedo : Evaluation of Twomey's Parameterization of Cloud Susceptibility Using Measurements of Ship Tracks". Physics. 57 (16): 2684–2695. Bibcode:2000JAtS...57.2684A. doi:10.1175/1520-0469(2000)057<2684:EOAOCA>2.0.CO;2. ^ Kaufman, Y. J.; Fraser, Robert S. (1997). "The Effect of Smoke Particles on Clouds and Climate Forcing". Science. 277 (5332): 1636–1639. doi:10.1126/science.277.5332.1636. ^ Ferek, Ronald J; Garrett, Timothy; Hobbs, Peter V; Strader, Scott; Johnson, Doug; Taylor, Jonathan P; Nielsen, Kurt; Ackerman, Andrew S.; Kogan, Yefim; Liu, Qingfu; Albrecht, Bruce A.; Babb, David; et al. (2000). "Drizzle Suppression in Ship Tracks". Journal of the Atmospheric Sciences. 57 (16): 2707–2728. Bibcode:2000JAtS...57.2707F. doi:10.1175/1520-0469(2000)057<2707:DSIST>2.0.CO;2. hdl:10945/46780. ^ Rosenfeld, D (1999). "TRMM observed first direct evidence of smoke from forest fires inhibiting rainfall". Geophysical Research Letters. 26 (20): 3105–3108. Bibcode:1999GeoRL..26.3105R. doi:10.1029/1999GL006066. ^ a b Hansen, J.; Sato, M.; Ruedy, R. (1997). "Radiative forcing and climate response". Journal of Geophysical Research. 102 (D6): 6831–6864. Bibcode:1997JGR...102.6831H. doi:10.1029/96JD03436. ^ Ackerman, A. S.; Toon, O. B.; Stevens, D. E.; Heymsfield, A. J.; Ramanathan v, V.; Welton, E. J. (2000). "Reduction of Tropical Cloudiness by Soot". Science (Submitted manuscript). 288 (5468): 1042–1047. Bibcode:2000Sci...288.1042A. doi:10.1126/science.288.5468.1042. PMID 10807573. ^ Koren, I.; Kaufman, Y. J.; Remer, L. A.; Martins, J. V. (2004). "Measurement of the Effect of Amazon Smoke on Inhibition of Cloud Formation". Science. 303 (5662): 1342–1345. Bibcode:2004Sci...303.1342K. doi:10.1126/science.1089424. PMID 14988557. ^ "6.7.2 Sulphate Aerosol". IPCC Third Assessment Report, Working Group I: The Scientific Basis. IPPCC. 2001. Archived from the original on 20 June 2002. Retrieved 10 August 2012. ^ Bond, T. C. (2013). "Bounding the role of black carbon in the climate system: A scientific assessment". Journal of Geophysical Research: Atmospheres. 118 (11): 5380–5552. Bibcode:2013JGRD..118.5380B. doi:10.1002/jgrd.50171. ^ McCormick, M P; L W Thomason; C R Trepte (1995). "Atmospheric effects of the Mt Pinatubo eruption" (PDF). Nature. 373 (6513): 399–404. Bibcode:1995Natur.373..399M. doi:10.1038/373399a0. Archived from the original (PDF) on 15 February 2010. ^ Stowe, L. L.; Carey, R. M.; Pellegrino, P. P. (1992). "Monitoring the Mt. Pinatubo aerosol layer with NOAA/11 AVHRR data". Geophysical Research Letters (Submitted manuscript). 19 (2): 159–162. Bibcode:1992GeoRL..19..159S. doi:10.1029/91GL02958. ^ Sid Perkins (4 March 2013). "Earth Not So Hot Thanks to Volcanoes". Science Now. Archived from the original on 7 March 2013. Retrieved 5 March 2013. ^ Neely, R. R. III; O. B. Toon; S. Solomon; J. P. Vernier; C. Alvarez; J. M. English; K. H. Rosenlof; M. J. Mills; C. G. Bardeen; J. S. Daniel; J. P. Thayer (2013). "Recent anthropogenic increases in SO2 from Asia have minimal impact on stratospheric aerosol". Geophysical Research Letters. 40 (5): 999–1004. Bibcode:2013GeoRL..40..999N. doi:10.1002/grl.50263. moderate volcanic eruptions, rather than anthropogenic influences, are the primary source of the observed increases in stratospheric aerosol. ^ a b Chung, C E; Ramanathan, V (2006). "Weakening of North Indian SST Gradients and the Monsoon Rainfall in India and the Sahel". Journal of Climate. 19 (10): 2036–2045. Bibcode:2006JCli...19.2036C. doi:10.1175/JCLI3820.1. ^ Region 4: Laboratory and Field Operations – PM 2.5 (2008).PM 2.5 Objectives and History. U.S. Environmental Protection Agency. ^ Nieuwenhuijsen, M.J. (2003). Exposure Assessment in Occupational and Environmental Epidemiology. London: Oxford University Press. ^ "Pollution Particles Lead to Higher Heart Attack Risk". Bloomberg L.P. 17 January 2008. Archived from the original on 29 June 2011. ^ Sapkota, Amir; Chelikowsky, Adam P.; Nachman, Keeve E.; Cohen, Aaron J.; Ritz, Beate (1 December 2012). "Exposure to particulate matter and adverse birth outcomes: a comprehensive review and meta-analysis". Air Quality, Atmosphere & Health. 5 (4): 369–381. doi:10.1007/s11869-010-0106-3. ISSN 1873-9318. ^ Zhang, Mingyu; Mueller, Noel T.; Wang, Hongjian; Hong, Xiumei; Appel, Lawrence J.; Wang, Xiaobin (1 January 2018). "Maternal Exposure to Ambient Particulate Matter ≤2.5 µm During Pregnancy and the Risk for High Blood Pressure in Childhood". Hypertension. 72 (1): 194–201. doi:10.1161/HYPERTENSIONAHA.117.10944. ISSN 0194-911X. PMC 6002908. PMID 29760154. Archived from the original on 19 May 2018. Retrieved 18 May 2018. ^ a b c Group, US EPA National Center for Environmental Assessment, Research Triangle Park Nc, Environmental Media Assessment; Sacks, Jason. "2009 Final Report: Integrated Science Assessment for Particulate Matter". cfpub.epa.gov. Retrieved 31 March 2017. ^ Erickson, Anders C.; Arbour, Laura (26 November 2014). "The Shared Pathoetiological Effects of Particulate Air Pollution and the Social Environment on Fetal-Placental Development". Journal of Environmental and Public Health. 2014: 1–20. doi:10.1155/2014/901017. ISSN 1687-9805. PMC 4276595. PMID 25574176. ^ Lee, Pei-Chen; Talbott, Evelyn O.; Roberts, James M.; Catov, Janet M.; Bilonick, Richard A.; Stone, Roslyn A.; Sharma, Ravi K.; Ritz, Beate (1 August 2012). "Ambient air pollution exposure and blood pressure changes during pregnancy". Environmental Research. 117: 46–53. Bibcode:2012ER....117...46L. doi:10.1016/j.envres.2012.05.011. PMC 3656658. PMID 22835955. ^ Woodruff, Tracey J.; Parker, Jennifer D.; Darrow, Lyndsey A.; Slama, Rémy; Bell, Michelle L.; Choi, Hyunok; Glinianaia, Svetlana; Hoggatt, Katherine J.; Karr, Catherine J. (1 April 2009). "Methodological issues in studies of air pollution and reproductive health". Environmental Research. 109 (3): 311–320. Bibcode:2009ER....109..311W. doi:10.1016/j.envres.2008.12.012. PMID 19215915. ^ Byrne, C. D.; Phillips, D. I. (1 November 2000). "Fetal origins of adult disease: epidemiology and mechanisms". Journal of Clinical Pathology. 53 (11): 822–828. doi:10.1136/jcp.53.11.822. ISSN 0021-9746. PMC 1731115. PMID 11127263. ^ Barker, D J (17 November 1990). "The fetal and infant origins of adult disease". BMJ: British Medical Journal. 301 (6761): 1111. doi:10.1136/bmj.301.6761.1111. ISSN 0959-8138. PMC 1664286. PMID 2252919. ^ Cohen, A. J.; Anderson, Ross H.; Ostro, B; Pandey, K. D.; Krzyzanowski, M; Künzli, N; Gutschmidt, K; Pope, A; Romieu, I; Samet, J. M.; Smith, K (2005). "The global burden of disease due to outdoor air pollution". J. Toxicol. Environ. Health Part A. 68 (13–14): 1301–7. doi:10.1080/15287390590936166. PMID 16024504. ^ "Air Pollution & Cardiovascular Disease". National Institute of Environmental Health Sciences. Archived from the original on 14 May 2011. ^ Lave, Lester B.; Eugene P. Seskin (1973). "An Analysis of the Association Between U.S. Mortality and Air Pollution". Journal of the American Statistical Association. 68 (342): 342. doi:10.1080/01621459.1973.10482421. ^ Mokdad, Ali H.; et al. (2004). "Actual Causes of Death in the United States, 2000". J. Am. Med. Assoc. 291 (10): 1238–45. doi:10.1001/jama.291.10.1238. PMID 15010446. ^ a b "Spatial assessment of PM10 and ozone concentrations in Europe". European Environment Agency (EEA). 2005. doi:10.2800/165. ^ Lim SS, Vos T, Flaxman AD, Danaei G, Shibuya K, Adair-Rohani H (2012). "A comparative risk assessment of burden of disease and injury attributable to 67 risk factors and risk factor clusters in 21 regions, 1990–2010: a systematic analysis for the Global Burden of Disease Study 2010". The Lancet. 380 (9859): 2224–2260. doi:10.1016/s0140-6736(12)61766-8. PMC 4156511. PMID 23245609. ^ Pope, C Arden; et al. (2002). "Cancer, cardiopulmonary mortality, and long-term exposure to fine particulate air pollution". J. Am. Med. Assoc. 287 (9): 1132–1141. doi:10.1001/jama.287.9.1132. PMC 4037163. PMID 11879110. ^ EU's PM2.5 Limit Festering: New Study Linked PM with Heart Attack Cesaroni G, Forastiere F, Stafoggia M, Andersen ZJ, Badaloni C, Beelen R, Caracciolo B, de Faire U, Erbel R, Eriksen KT, Fratiglioni L, Galassi C, Hampel R, Heier M, Hennig F, Hilding A, Hoffmann B, Houthuijs D, Jöckel KH, Korek M, Lanki T, Leander K, Magnusson PK, Migliore E, Ostenson CG, Overvad K, Pedersen NL, J JP, Penell J, Pershagen G, Pyko A, Raaschou-Nielsen O, Ranzi A, Ricceri F, Sacerdote C, Salomaa V, Swart W, Turunen AW, Vineis P, Weinmayr G, Wolf K, de Hoogh K, Hoek G, Brunekreef B, Peters A (2014). "Long term exposure to ambient air pollution and incidence of acute coronary events: prospective cohort study and meta-analysis in 11 European cohorts from the ESCAPE Project". BMJ (Clinical Research Ed.). 348: f7412. doi:10.1136/bmj.f7412. PMC 3898420. PMID 24452269. ^ Hussey, Shane. J. K.; Purves, Joanne; Allcock, Natalie; Fernandes, Vitor E.; Monks, Paul S.; Ketley, Julian M.; Andrew, Peter W.; Morrissey, Julie A. (1 February 2017). "Air pollution alters Staphylococcus aureus and Streptococcus pneumoniae biofilms, antibiotic tolerance and colonisation". Environmental Microbiology. 19 (5): 1868–1880. doi:10.1111/1462-2920.13686. ISSN 1462-2920. PMID 28195384. ^ Aaron J. Cohen; H. Ross Anderson; Bart Ostro; Pandey, K. D.; Krzyzanowski, M; Künzli, N; Gutschmidt, K; Pope, A; Romieu, I; Samet, J. M.; Smith, K (2005). "The Global Burden of Disease Due to Outdoor Air Pollution". Journal of Toxicology and Environmental Health, Part A:. 68 (13–14): 1301–7. doi:10.1080/15287390590936166. PMID 16024504. ^ Laden, F., Neas, L.M., Dockery, D.W. and Schwartz, J., 2000. Association of fine particulate matter from different sources with daily mortality in six US cities. Environmental health perspectives, 108(10), p.941. ^ Hogan, C.Michael (2010). Emily Monosson and C. Cleveland (ed.). "Abiotic factor". Encyclopedia of Earth. National Council for Science and the Environment. ^ Hamra, Ghassan B.; et al. (September 2014). "Outdoor Particulate Matter Exposure and Lung Cancer: A Systematic Review and Meta-Analysis". Environmental Health Perspectives. 122 (9): 906–11. doi:10.1289/ehp.1408092. PMC 4154221. PMID 24911630. Retrieved 2 September 2014. ^ Department of the Environment (25 February 2016). "National Environment Protection (Ambient Air Quality) Measure". Federal Register of Legislation. Retrieved 16 November 2018. ^ "Canadian Ambient Air Quality Standards (CAAQS) for Fine Particulate Matter (PM2.5) and Ozone" (PDF). ^ "Air Quality Standards – Environment – European Commission". Ec.europa.eu. Retrieved 1 February 2015. ^ "Air Quality Objectives". Environmental Protection Department, Hong Kong. 19 December 2012. Retrieved 27 July 2013. ^ "微小粒子状物質（ＰＭ2.5）対策｜東京都環境局 大気・騒音・振動・悪臭対策". Kankyo.metro.tokyo.jp. Retrieved 1 February 2015. ^ "細懸浮微粒管制". Environmental Protection Administration, ROC. Retrieved 16 November 2015. 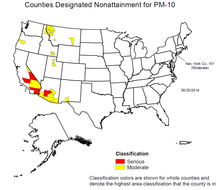 ^ "Environmental Protection Agency – Particulate Matter (PM-10)". Epa.gov. 28 June 2006. Retrieved 1 February 2015. ^ "Pm Naaqs | Us Epa". Epa.gov. Retrieved 1 February 2015. ^ "Nanotechnology web page". Department of Toxic Substances Control. 2008. Archived from the original on 1 January 2010. ^ a b "Chemical Information Call-In web page". Department of Toxic Substances Control. 2008. ^ "Contact List for CNT January 22 & 26 2009 Document" (PDF). ^ "Archived DTSC Nanotechnology Symposia". Department of Toxic Substances Control. Archived from the original on 1 January 2010. ^ Consulate General of the United States of America Guangzhou, China (n.d.). "U.S. Consulate Air Quality Monitor and StateAir". U.S. Department of State. Archived from the original on 1 July 2011. Retrieved 24 December 2014. JEFF CHARLTON Pandemic planning: a review of respirator and mask protection levels. Look up particulates in Wiktionary, the free dictionary.